Rabbi Shimon said, to see what is born. 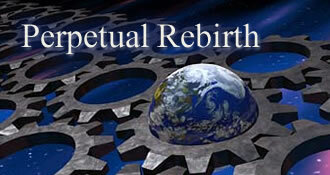 A cornerstone of the teachings of Rabbi Israel Baal Shem Tov is the doctrine of "Perpetual Creation." Briefly stated, this means that G-d's creation of the universe, commonly perceived as a one-time event, is a continual act on His part. In each and every fraction of time the world is born anew out of a state of absolute nothingness, as the Creator again imparts life and being to every existence. Here we have the deeper meaning implicit in Rabbi Shimon's praise of "one who sees that which is born.." Rabbi Shimon is saying: Behold the world's perpetual birth out of utter nothingness. Do not perceive the universe as an existence in its own right - understand that in essence it is nothing, that this seemingly formidable reality of a moment ago is now not and must again be brought into being by the Creator. What is real is only the divine will to create. The implications of this perspective on existence are manifold. Often, the "realities" of our world appear to preclude one's fulfillment of G-d's will: "realistically" one may see no way of earning a living unless one works on Shabbat; "realistically" one's efforts to positively influence one's fellow stand no chance of success. But one who sees the world born anew every instant of time by an act of divine creation understands that "reality" can never be inconsistent with the divine will. It's not even a question of the divine will being more "powerful" than reality; reality is nothing but the fact of G-d's will to create it, as it is, in the present micro-moment.